With a career now spanning over 40 years and more than 100 recordings, Joe McPhee has shown that emotional content and theoretical underpinnings are thoroughly compatible — and in fact, a critically important pairing — in the world of creative improvised music. Since recordingThe Hated Music with Paul Flaherty in 2000, Chris Corsano has been hyper-active in far-reaching corners of the free improvised world. Under A Double Moon, recorded live in Paris during a spring 2010 tour of Europe, is their first album together (and, given how phenomenally simpatico a partnership they’ve forged, we hope it’s not the last). With cover artwork by Judith Lindbloom and liner notes by John Szwed. Download coupon included. “Recorded live at legendary Parisian venue Les Instants Chavirés, Under A Double Moon represents a passing of the torch between two of Fire Music’s most formidable flame bearers. This pairing makes a lot of sense. Both Corsano and McPhee share an autodidactic approach to jazz, using anything from thriftstore miscellany to customised electronics to explain the white heat of their creativity. 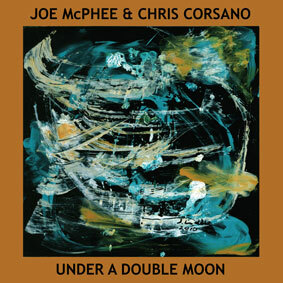 Both have almost unquantifiable discographies that extend well beyond the confines of ‘jazz’; McPhee studied Deep Listening techniques with Pauline Oliveros and Corsano has sparred with everyone from Jim O’Rourke to Björk. Both have lived in Europe, enjoying the hospitality extended to innumerable US free jazz expats that had eluded them in their native terrain. Most impressively, both are lavishly gifted musicians. If McPhee’s 1969 album, Underground Railroad, represented a watershed in high velocity, second generation free blowing, then Corsano’s debut with Paul Flaherty, The Hated Music, saw the drummer pick up the baton, skewer a bouncing ball with it and rub it against a cymbal until it sang like a sea lion. Suffice to say Under A Double Moon goes beyond the scorched-earth Fire Music you might expect. The two long tracks that comprise side one, “Dark Matter: Parts 1 And 2”, shows Corsano at his most flexible as he switches from gamelan-inflected tuned percussion to subtle brushwork to omnivorous hard bop, providing a multiplicity of textures for McPhee’s assorted reeds. McPhee is dominant in the mix, which can obscure the sheer multi-dimensionality of Corsano’s drumming, but both players leave ample room for the other to solo. In fact, both use silence like a weapon – loading the pauses with dramatic intent before unleashing another blizzard of ideas.